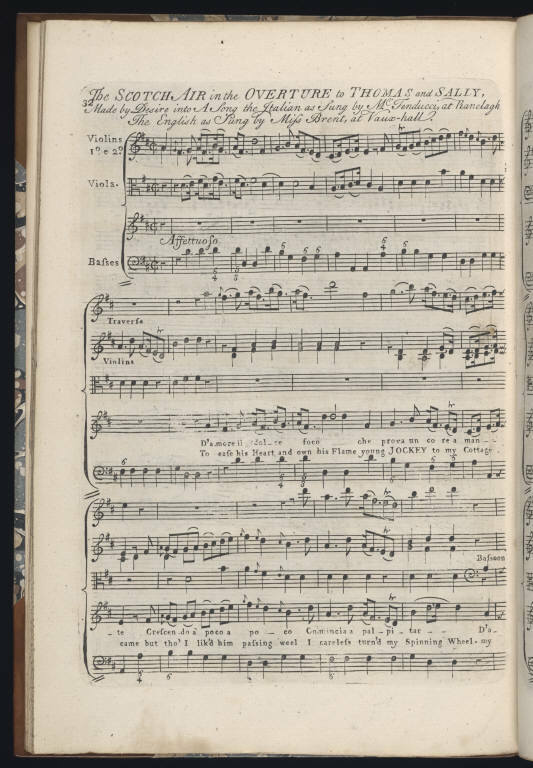 As an exhibition, God Save the King celebrates the opening of a new scholarly collection, the Hanover Royal Music Archive, acquired by Yale’s Beinecke Library in 2008, catalogued by co-curator Karen Spicher, and made available for research at the library. The exhibition highlights two of the many perspectives rewarded by the archive: not only its possibilities as a musicological collection, documenting the creation and performance of court and popular music in the particular historical context of the Hanoverian court, but also its importance as a social historical collection, offering a glimpse into the social and economic markets, the public and private musical cultures of a household and court. 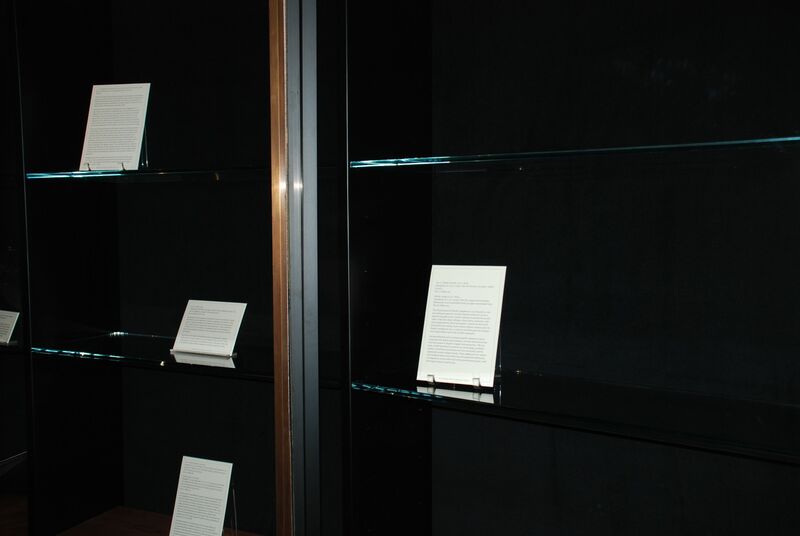 The exhibition blog, a companion to the physical exhibit itself, points to some of the items and facets which we were not able to include in the exhibition—the tremendous scope for scholarship, as it will develop over the next decades from researchers’ engagement with the archive. After the exhibition closing this month, we will create a web exhibit, offering an online version of the always ephemeral encounter with a collection offered by a physical exhibit. The exhibit offers one discussion of the Hanover Royal Music Archive, only one of the many which will be undertaken in scholarship, teaching, performance over the next decades of the collection’s history. 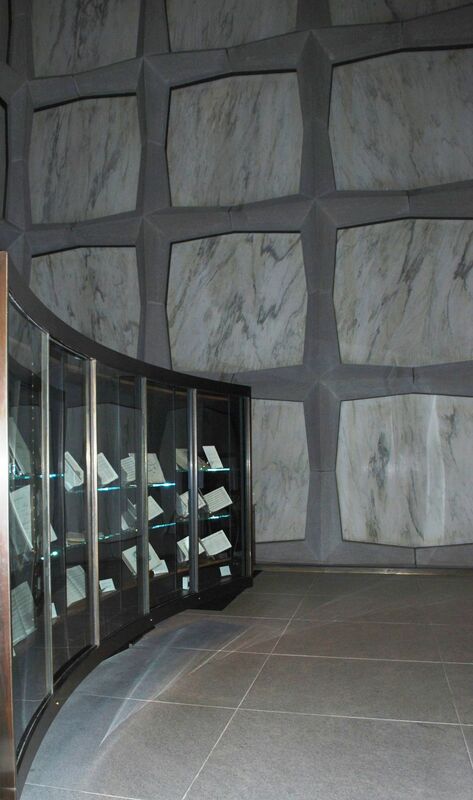 The exhibit also marked another moment in the Beinecke’s history, when it was partially de-installed for an exhibition commemorating the Beinecke’s director, Frank Turner, who died unexpectedly this November. 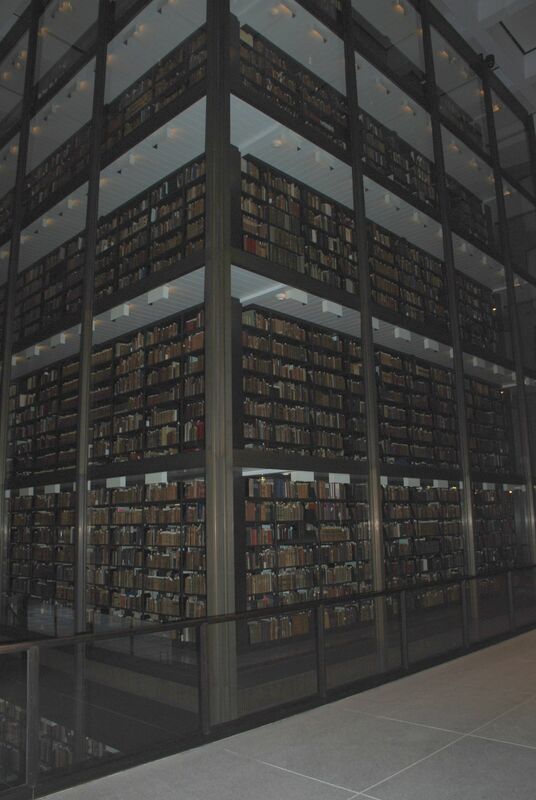 The Hanover Royal Music Library was only one of many acquisitions made under Frank’s leadership as director, and an example of his commitment to building the Library’s collections and opening them to scholarship, through cataloguing, digitization, the Beinecke’s fellowship program, and the Library’s reading room. 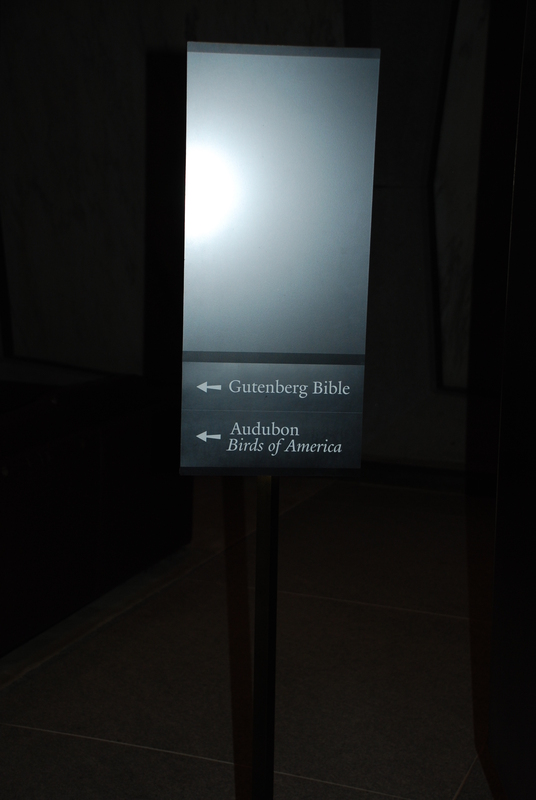 These two exhibitions can be viewed together through December 11. Seen together, the exhibits show the Hanover Royal Music Archive in another aspect, as a collection among collections, an example among others of the extraordinary scope of the Beinecke collections for humanistic scholarship, under Frank Turner’s leadership and in the years to come. The Hanover Royal Music Archive intersects in often unexpected ways with the Beinecke Library’s holdings for music, literature, and social history in late eighteenth- and early nineteenth-century Britain. Above, a letter from the Italian castrato, Giusto Ferinando Tenducci, written towards the end of his life, ca. 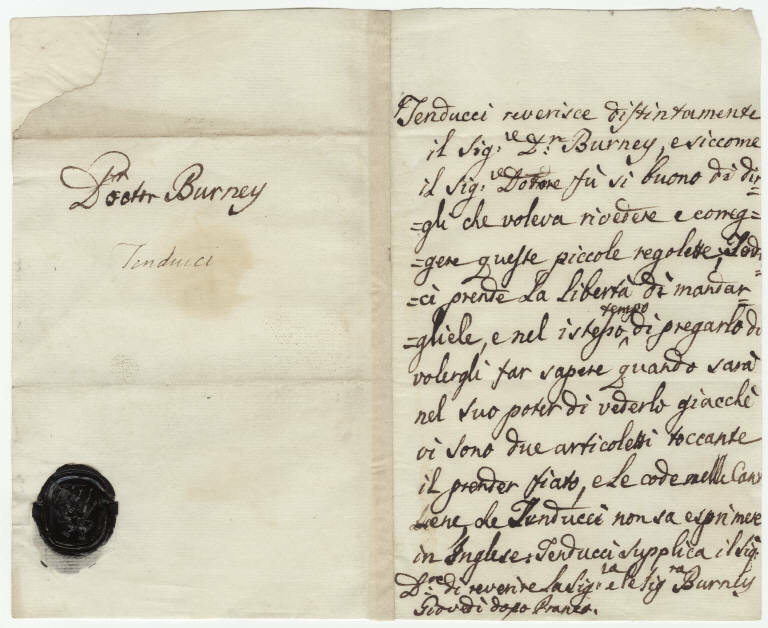 1790, to “il Signore e Dr Burney,” the English composer and music historian, Charles Burney (OSB MSS 3, Box 15). From 1758 – 1765, and from 1768 to near the end of his life, Tenducci was in London, performing at the King’s Theatre and the Royal Opera House, and working with composers such as Johann Christian Bach, whose work is also represented in the Hanover Royal Music Archive. Tenducci’s propensity for “Scotch” songs might have influenced J.C. Bach to include Scottish songs in his English operas, a fashion also seen in the Scottish overture to Thomas Arne’s “Thomas and Sally” of 1760, above, “made by desire into a song, the Italian sung by Mr Tenducci at Ranelagh, the English by Miss Brent, at Vaux-hall” (ca. 1762; Beinecke call number: Ma31 Ar6 S81). 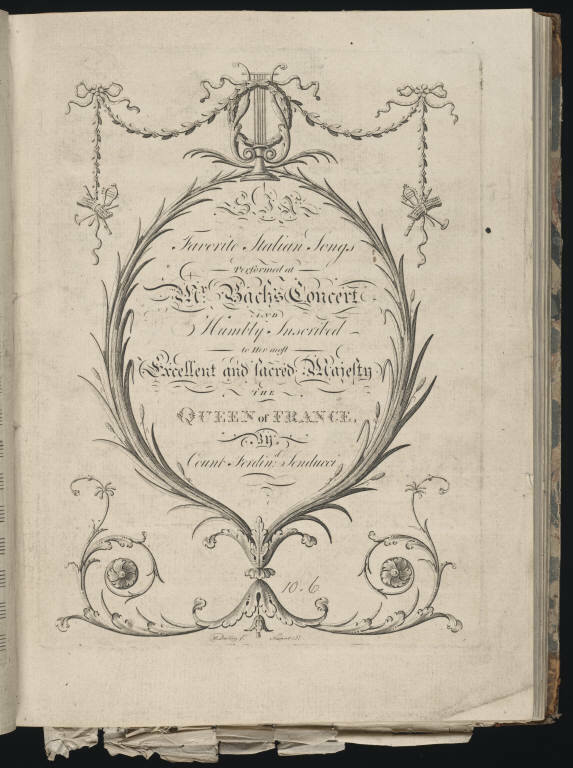 Tenducci’s performances, and the play of patriotic and national identities in the musical and literary world of late eighteenth-century London, can be traced through the Hanover Royal Music Archive, as in the examples above, from the “Six favorite Italian songs performed at Mr Bachs concert,” 1778 (OSB MSS 146, Box 861). This work, signed by Tenducci, can be found in one of the several dozen bound collections in the archive, this particular volume inscribed “Cheveley” and also containing a holograph manuscript of Johann Christian Bach’s “T’adoro te solo eterno mio Dio,” c. 1770. A similar volume (OSB MSS 146, Box 874), one of several entitled “Englische Gesaenge,” holds copies of the first and second “favorite rondeau of Mr. Tenducci,” alongside a holograph manuscript of that most English of hymns, “Holy, Holy, Holy.” The performance, by an Italian castrato, of these English compositions, in an album entitled “English songs,” in German, and compiled by members of a royal family at once English and Hanoverian is only one glimpse, among many, of the complexities of national identity at work in the Hanover Royal Music Archive. 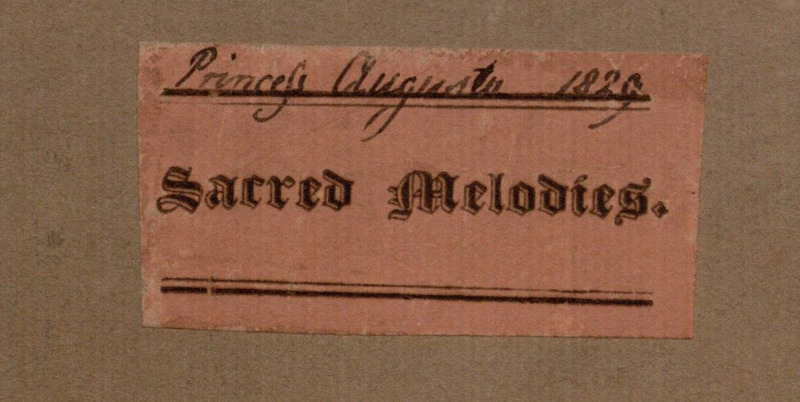 The youngest of King George III’s daughters, and–of Queen Charlotte’s children who survived infancy–the shortest-lived, Princess Amelia (1783 – 1810) is an active musical presence in the Hanover Royal Music Archive. Her notebooks offer a glimpse into her life, spent almost entirely at the Hanoverian court in London, and document her enthusiasm for popular musical culture of the late eighteenth century, including notebooks and scores of opera, song, and dance. One of the bound volumes (OSB MSS 146, Box 853) inscribed “Amelia, 1798 Janry 12, Windsor,” contains a typically multi-faceted selection, including Mozart’s A Duet for two Performers (K.381, [c. 1797]), Haydn’s Symphony, H. I, 97, C major and his Celebrated Overture [c.1796], and Handel’s Overture in Esther. Works are frequently signed by one or another member of the royal family (Augusta, for instance, signed the Mozart) and the album is annotated–sometimes in identifiable hands, more often not–throughout. 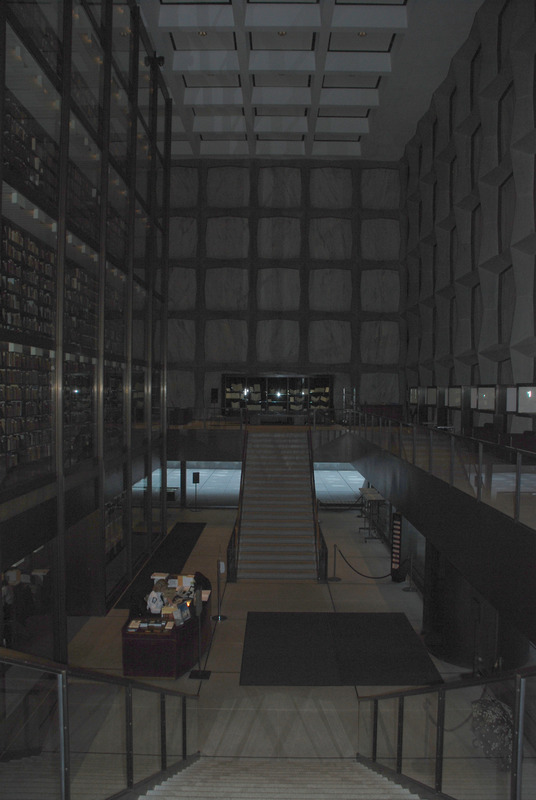 Photographs from the exhibition opening at the Beinecke last night, with a wonderful performance by the Jasper String Quartet. 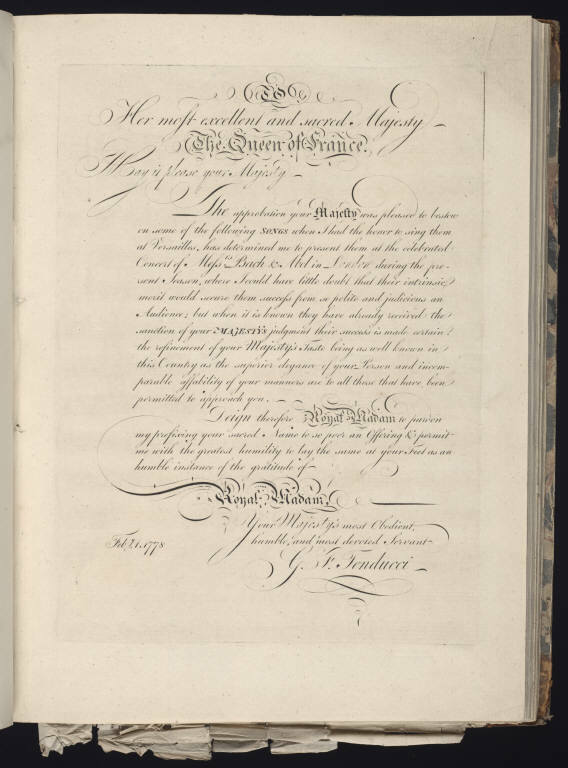 As part of a household music library, the Hanover Royal Music Archive captures the musical interests of many of the fifteen children of George III and Queen Charlotte from the late eighteenth century through 1837. The archive was created because of one of these children, and represents the musical library which went with Ernest Augustus, Duke of Cumberland, to Germany when he became King of Hanover in 1837, and which he continued to develop at the Hanover court. 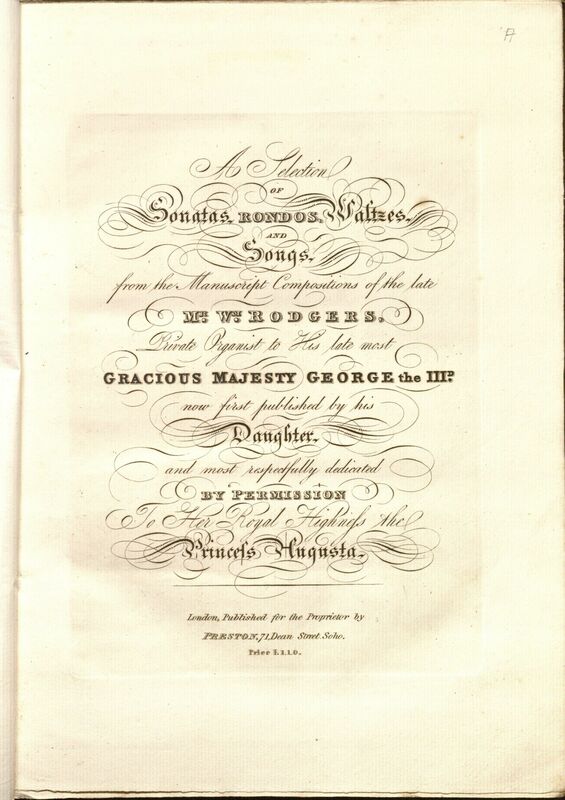 The collection also documents the energetic musical life of the family household in England, whether in music notebooks, albums of printed and manuscript music, works dedicated and presented to members of the royal family, or the collection of the Duke of Cumberland’s band. In particular, the collection helps to bring into focus the musical lives of the six daughters of George III: Charlotte, Augusta, Elizabeth, Mary, Sophia, and Amelia. Several of the princesses were musically active. The collection is particularly interesting for its insight into the musical career of Princess Augusta, whose activities are documented from the 1780s through the early 1830s. The collection contains several music notebooks signed by her, with manuscript contents in several different hands, and these indicate that she not only played music at the royal household, but also spent considerable time thinking, discussing, and collecting music. The albums contain corrections and drafts of music, showing her interest in the practical nuances and details of performed music. The collection contains many works dedicated to Augusta. In this, she can be seen as an active and influential patron of music in England, receiving letters, dedications, and presentation copies from composers. Her notebooks contain works, in print and manuscript, by important English court composers like Johann Christian Bach and Charles Edward Horn, as well as many dozens of other less well-known composers, encompassing musical genres from hymns to sonatas to Scottish ballads. Also visible in the Hanover Royal Music Archive are the relationships between the children. Many volumes are inscribed to Augusta from her siblings: in some examples, Frederick Augustus inscribed an album of sonatas by Johann Forkel to Augusta in 1787, Augusta inscribed an album to her younger sister Amelia, and inherited one of Amelia’s albums from her brothers Ernest Augustus and Frederick on Amelia’s death. Augusta never married, and remained in England until her death, at Clarence House, St James, in September of 1840. 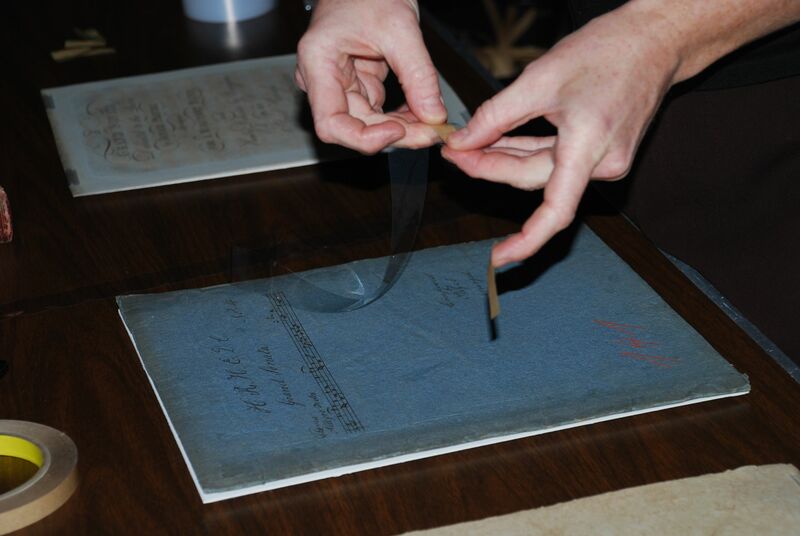 The archive holds a tremendous amount of material relating to her musical interests, from the late 1780s through the 1830s. As well as supporting research more generally in popular musical culture and the musical lives of households and the royal family in the period, the collection also offers the opportunity to focus on Augusta as a musical performer, consumer, and patron in England at the turn of the century. But then—How Celia stepp’d a Waltz! Waltzing was everywhere the Ton. She might be coax’d to keep away. William Combe’s tale of the poor dancing Celia, who “hop’d, her graceful Charms, Would Waltz her to a Husband’s Arms,” was famously illustrated by the English artist Thomas Rowlandson with a scene of a girl whirling in the arms of a skeleton. Combe and Rowlandson were not the first to celebrate the waltz’s gruesome charms, which in 1774 had also twirled the Young Werther, Goethe’s romantic hero, to his tragic love affair and fate. 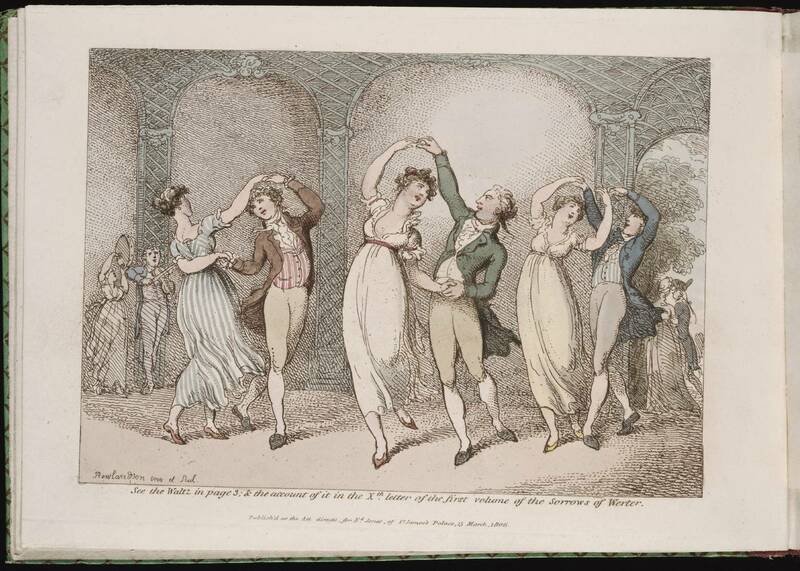 The Hanover Royal Music Archive also holds a view of the waltz by Rowlandson in 1806, showing all the indecorous dancing and delight which had become the waltz’s scandalous trademark. “See the waltz in page 3; and the account of it in the Xth letter of volume one of the Sorrows of Werter,” reads the caption, in case any of Rowlandson’s readers might have missed the scene’s romantic perils. Waltz mania had struck England in 1812. 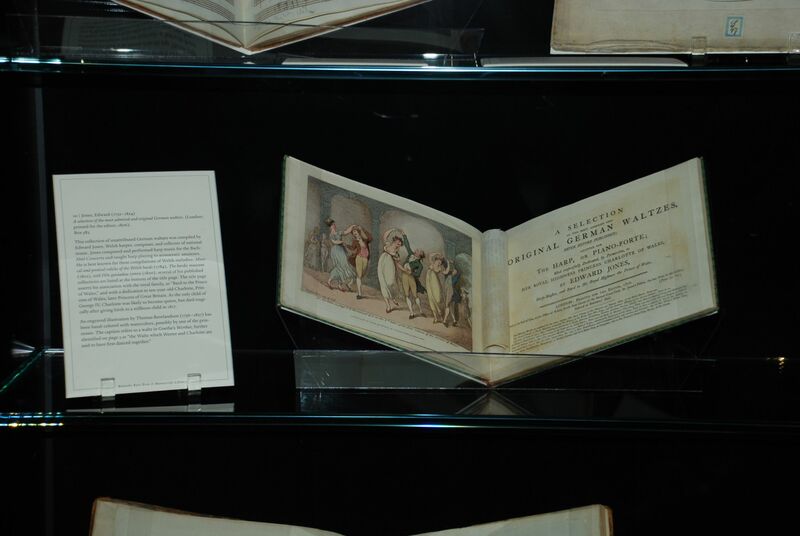 Byron’s “The Waltz: an apostrophic hymn” (1813) satirizes the dance’s popularity–and its wild adoption by the Hanoverian court, in the wake of the Regency Act of 1811. “Blest was the time Waltz chose for her debut,” wrote Byron, “The Court, the R—t, like herself were new.” (Dyer 1997; Childers 1969). As the gallery above reveals, waltzing played a central role in the musical life of the Hanoverian household, and particularly that of the Princess Augusta Sophia, who inscribed several volumes of waltzes in the collection and to whom several waltzes were also dedicated. One album, consisting entirely of waltzes and other dances for two hands on the keyboard, is inscribed “Augusta, the gift of Charlotte” (OSB MSS 146, Volume 821). 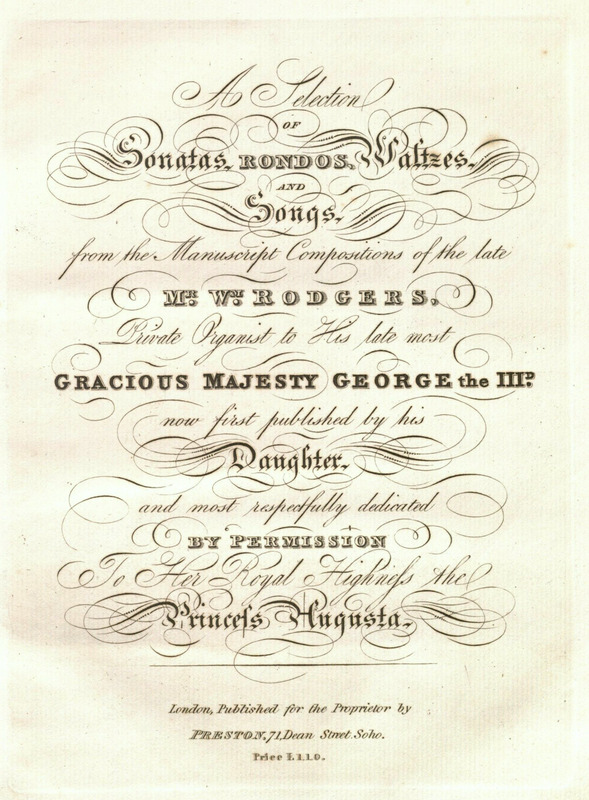 A collection of William Rogers’s waltzes and other compositions, shown below, was published by Rogers’s daughter after the death of George III, and dedicated to Princess Augusta. 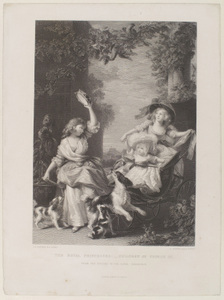 These and the images in the gallery above hint at the prominence of dancing and dance music in the Hanover royal family’s musical life, and represent only a selection of the dozens of albums of waltz and dance music–in print and manuscript, by British and Continental composers–to be found in the Hanover Royal Music Archive. Improves our cellar — thou our living stock. And wakes to wantonness the willing limbs. And only left us thy d—-d debts and dances ! We bless thee still — for George the Third is left ! For graciously begetting George the Fourth.